Architect Thomas Morris explains some of the special features in a mock patient room proposed for new medical center tower to Mike Noble, University of Vermont Medical Center media strategist. 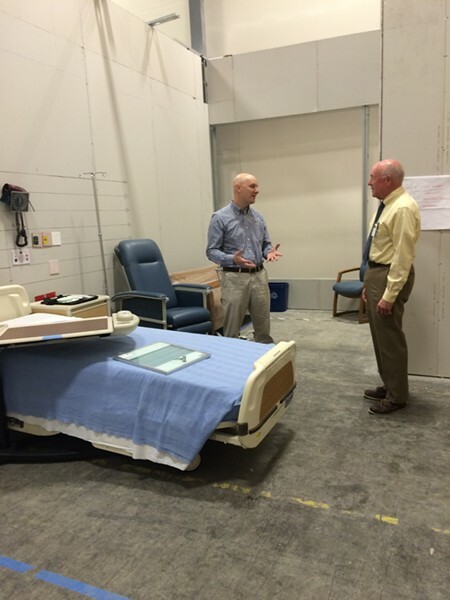 A hulking warehouse in Williston is an unlikely place to glimpse the future of hospital care. Still, in a corner of a warehouse that stores old medical records and long aisles of supplies, Thomas Morris showed a visitor mock-ups of the patient rooms that the University of Vermont Medical Center wants for a seven-story tower project awaiting state approval. Morris is a partner in the architecture firm Morris Switzer, hired to transform patient rooms at the state’s largest hospital. Most patients admitted today end up in double-occupancy rooms that no longer meet contemporary care standards. Only 30 percent of the hospital’s 447 staffed beds are single-occupancy. The medical center has proposed a $187 million project to replace the oldest double rooms with 128 spacious private ones in a new tower. A parade of medical center officials and consultants presented the case for the project to the Green Mountain Care Board over two days earlier this week. Considerable testimony focused on the benefits of private rooms, which officials argued are no longer viewed as luxury suites but as the standard when hospitals undertake projects. The medical center’s certificate-of-need application argues that single rooms reduce infection risks, decrease medication mistakes, and enhance patient wellbeing by accommodating families and reducing noise and traffic. Morris said the mock-ups — built to actual size with plasterboard walls, plywood closets, and paper pictures of outlets and equipment hookups — allowed his firm to tap the expertise of users to refine the design. Morris noted another feature — mini-work stations outside pairs of rooms. Windows at desk-level would allow nurses to monitor patients in the two rooms as they work. Morris held up a sample window made of two panes of glass with frosted stripes that can be adjusted to create an opaque opening for privacy. A similar glass system is planned for the doors to each room, he said, to allow more natural light to reach the corridor without compromising privacy. A patient and family committee also provided input. Al Charron, a former patient on the cardiac floor, testified before the Green Mountain Care Board Monday about his 13-day stay in one of the double rooms. He had a roommate whose family stayed so late that nurses threatened to call security. He also said that he was confined to a small space without a view outside. Charron said the mock-up showed him that patients would be able to see out windows from their beds. The board hasn’t visited the mock-ups, and won’t before making a decision sometime in June about granting a certificate of need for the project. Board members didn’t dispute the benefits of single-occupancy rooms, but they did pose questions about the cost. The backdrop for their questions was the scandal of more than a decade ago associated with the hospital’s last big construction project. Then-president William Boettcher lied to state regulators and duped his board about the cost of that project, saying the price tag was $173 million when the actual cost was $367 million. Boettcher ended up in jail. Many other top hospital executives and board members lost their positions, and the medical center maxed out its borrowing capacity. Gobeille pressed the trustees' chairman about their unanimous endorsement of the project. “Is the board exercising the power and authority to independently think?” he asked. “To get to unanimous, there was a tremendous amount of discussion,” chair John Powell said. Board members peppered chief financial officer Todd Keating with questions about financial risks, noting that hospital officials were promising they wouldn’t seek rate increases. The project depends on borrowing $100 million, raising $30 million in a capital campaign and managing annual operating costs.